In 1968, Dr David Grove, Professor Emeritus of Anthropology at the University of Illinois at Urbana-Champaign, discovered a series of 2500 year old cave paintings. 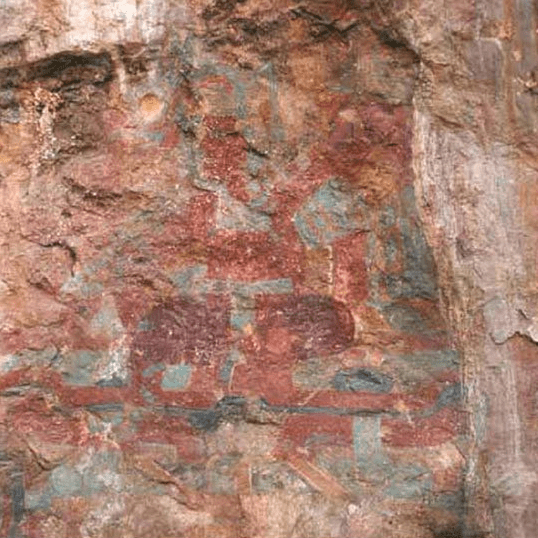 These paintings had been known to the locals for years and had been hidden by a mass of mineral stains and graffiti due to them being neglected. The locals believed that the paintings were a depiction of the devil, so threw rocks at them and had no interest in looking after them. The restoration of these colourful red and blue paintings took Sandra Cruz, a Mexican Government archaeologist, 12 years to complete. Grove joined Cruz on her first trip as he was the one who had originally registered them in 1968 after coming across them in an obscure travel book. He helped Cruz to identify where each of the paintings were located, as years of graffiti and mineral build ups had obscured them from view. Now fully restored, Cruz interprets the human like figure sitting above what appears to be an earth monster as an entreaty for rain and fertility. Grove told the locals it was the rain God, and if they destroyed it, their drinking water would disappear. This story was sufficient to deter them from their destructive actions. The local Oxtotitlans now take pride in the paintings, guarding them and screening who comes through to see them. This way, they are being properly looked after and can be preserved for the future.